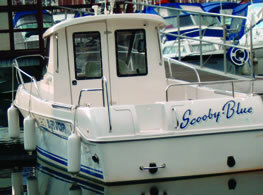 Vinyl lettering offers a highly durable, versatile, and cost-effective solution to applying graphics onto almost any surface. Vinyl is ideal if large designs consisting of several areas of block colour are required, if the design needs to be weatherproof, or has to retain its colour for a long time. Complex shapes are not a problem, the design can be cut right down to a matter of millimeters wide, multiple vinyl sections of different colour can be layered to build up a logo, and then applied to any clean surface, from a flat wall to the complex contours of a car chassis. This 16ft Shop frontage for Crackerjack toys (above) involved making the complete header panel from acrylic sheet prior to applying various colours of vinyl. 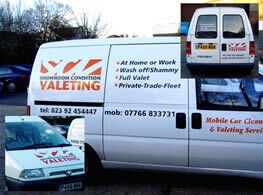 Vinyl graphics can be used for personalising or advertising on anything from cars to boats! 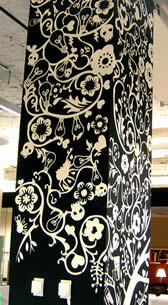 Vinyl graphics were used in a different way on this pillar in a New York department store. The vinyl was first applied then sprayed over with black paint, then the vinyl was removed to leave this intricate design.